The world isn't actually short of various designs using one or two transistors to make little AM transmitter circuits that will broadcast a few feet, so that you can listen to your iPod over that classic valve radio that you just bought. But I needed a circuit to use as a tutorial for some electronics basics (thanks, Frank:) and I thought that I would see what I could create with a 4069 unbuffered hex inverter using some Pulse Width Modulation to create the AM signal. You need to use the unbuffered 4069UBE type for this. Parts with just 4069 or 4069UB should work. 74HC4069, or 4069B or BE will definitely not. As we all know, with some output to input feedback, you can use these old single stage unbuffered CMOS inverters as an inverting amplifier in a linear mode where both of the transistors are conducting. Over the years, engineers have delighted in using this peculiarity to create analogue audio and radio systems from this simple digital chip. When you see new designs like that these days, when you can buy an LM324 quad op-amp for 10pee you'd be forgiven for getting a bit infuriated with them for making life unnecessarily difficult. LM324s won't do PWM at 1MHz though, so you'll have to forgive me for using one of the inverters in this 'trick' linear mode for the audio input buffer, because I didn't want another whole IC in the design. Let's start with the carrier oscillator. This is three inverters in a ring oscillator configuration with the frequency primarily set by the RC time constant of the feedback resistors and the capacitor at the input. This is pretty simple so far and is explained in a National Semiconductor application note on the subject. You need three inverters to get enough gain, and if you attempt to use just one you will end up with self biassing at mid-rail. The audio input is designed to take analogue left and right from a music player. The left and right signals are summed by having 10k resistors R1 and R2 on each input feeding R3, the 10k audio level pot. C3 to ground is to filter out any RF getting into the inputs and to stop it getting out into the source. The audio output is taken from the pot wiper and a.c. coupled into the inverting amplifier consisting of R4, R5 and C5. C5 provides a gentle roll-off above 6kHz so that the transmission audio bandwidth is sensible. The point of having an audio amplifier at the input is to isolate the inputs from the general RF switching going on, and to keep the sensitive part of the PWM nicely biassed by another of the on-chip buffers. With no audio input, the output of U1F sits at mid rail. The centre modulation adjust R6 is nominally at the mid-point. The capacitor on the input of U1E sits at about mid rail and U1E is in an undefined condition, possibly high or low depending on the exact setting of the modulation 50% adjust pot. 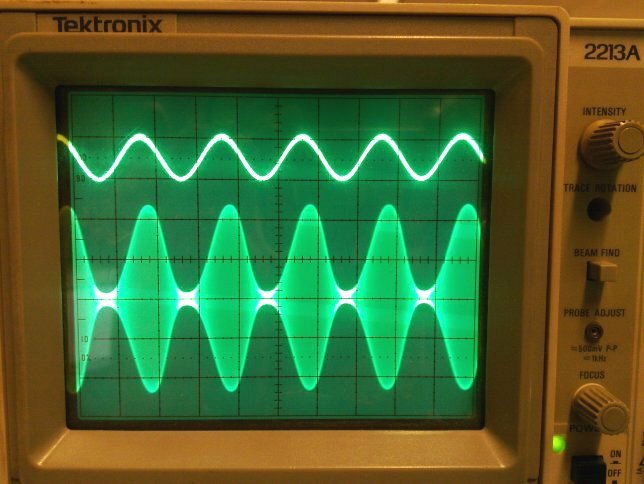 Then we inject the carrier square wave through R9. When the carrier output is high the PWM input capacitor C7 charges up and beyond a certain threshold, the output of U1E will go low. When the carrier is low, the cap discharges through R9 and beyond the threshold, the U1E output goes high. The voltage on the cap rises and falls in the expected exponential ramp seen when charging a cap from a voltage source through a fixed resistance, but because the amplitude of the signal here is quite small, we see only a small part of that ramp, so small that it is very nearly a linear ramp. The audio added onto the carrier through R8 shifts this ramp up and down around the switching threshold, and so creates a PWM output. It's now possible to adjust R6 so that you get a 50% duty cycle from U1E, and if you now feed in audio, you will see traditional PWM coming out of U1E with the output spending more time high for a high audio input voltage and vice-versa. (I'm referring back to the actual audio input which is inverted in U1F and then effectively inverted again in the PWM U1E.) But this isn't what we want to make an AM radio signal at the carrier frequency. 50% duty cycle coming from U1E will produce the maximum output from our transmitter when driving into an inductor and suitably filtered, which should happen when the audio input is peak high. 0 or 100% from U1E will produce zero output which should happen when audio input is peak low. So with no audio input, R6 should be set to about 25% or 75% PWM so that a signal will take the modulator up to 50% and 'down' to 0 or 100. A smaller cap or smaller input R8 or R9 will result in a bigger ramp on the U1E input which will flatten more at its peaks. A bigger ramp means less gain in the PWM section as the audio signal has to be bigger so swing it about the logic threshold. On the face of it, the less linear ramp will produce modulation nonlinearity, but the flattening ramp on the input produces an increase in the output. 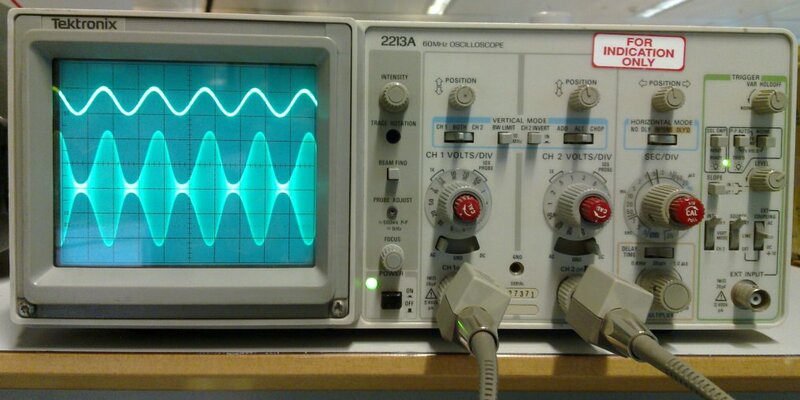 This will tend to be 2nd and even harmonic distortion which makes the output AM signal have bigger peaks. As there are odd harmonic "peak squashing" opposite effects going on in the audio amp stage and in the output buffer as the transmitter reaches modulation peaks, this is not necessarily a bad thing as they work to cancel out. The values shown in the schematic will work well, but it is certainly possible to adjust them to alter the compromises between non-linearity in various parts of the circuit, PWM threshold noise, and audio gain. At the smaller end of the range, the ramp signal needs to be big enough to get the PWM inverter to switch properly, at the larger end, the gain will be low and the audio input buffer will be beyond its limited drive range for a reasonably linear behaviour, that being about 1Vpp. With the slow drive signals at the input, the PWM output is naturally quite slow, so it is buffered by the remaining inverter which is a.c. coupled to the output. Here's a picture of the prototype board with the power input mid left, audio input top left and connection to the output coil top right. The pot at the bottom is for frequency adjustment and the one at the top right is the d.c. offset adjust into the pulse width modulator. 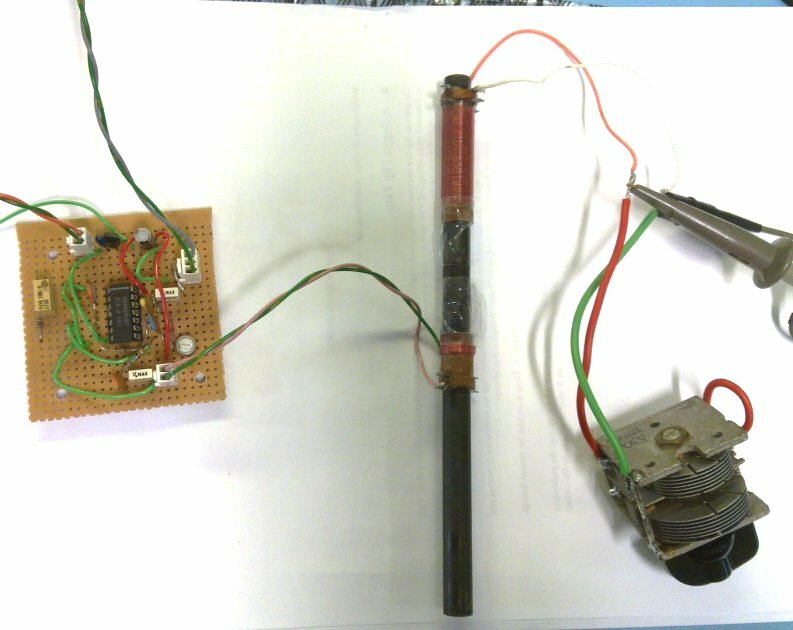 Picture showing the circuit connected to a large ferrite rod, with a coupling coil in the middle and a resonant MW coil at the top. There's more than one way to do this. You could have a small on-board resonant LC tank which would probably emit enough magnetic signal into a close-by radio. In my prototype I have R12 at a nominal 47 Ohm value on the output and a small value capacitor C8 to roll off harmonics which will be present. In practice the output buffer impedance is larger than R12 in any case and as we are pushing the 4069 quite hard in terms of frequency and driving various stages with slow inputs, the output isn't that full of harmonics in any case. I connect this output direct into a LW coil on an 8 inch ferrite rod which is fitted with a MW coil and a parallel variable cap for tuning to resonance. You could equally well make a 10cm diameter small loop of 10 turns of hookup wire and this would be enough for what we are actually making and would be untuned and allow easy frequency changing. Or you could put more turns on your small loop, (perhaps 50) and use a trimmer capacitor in place of C8 to resonate that loop at your chosen output frequency. You'd need an oscilloscope or a little tuning meter to do that. Don't connect long wire antennas to this. The output power is very small anyway but the circuit is only intended to create a very local, primarily magnetic AM radio signal. Anything else is very anti-social, and if you want to broadcast an AM radio signal there are much better ways to do it. The main circuit runs from a 9V battery regulated down to 5V and uses less than 6mA. 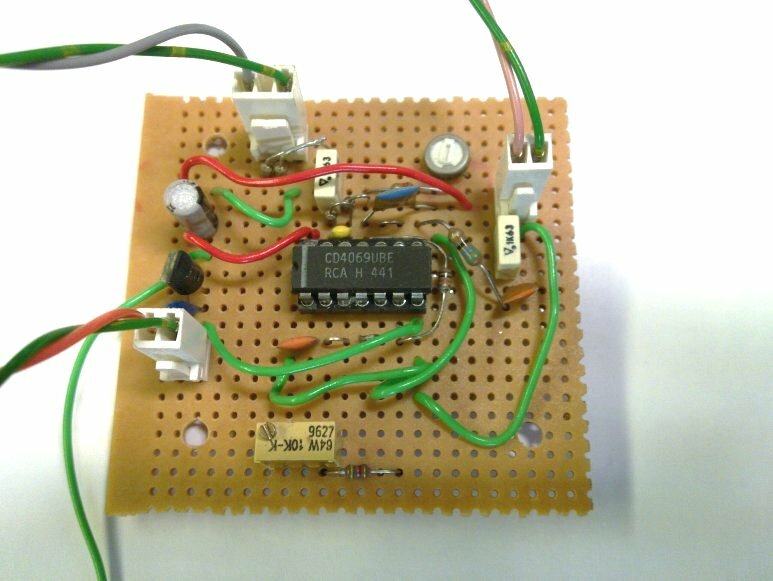 A stabilised 5V is required particularly for the oscillator and modulator and a small 78L05ACZ regulator provides that. The 1.7V dropout on the regulator will discharge that down to less than 6.7V before the 5V rail sags, probably less at this low current. This allows you to use a rechargeable if you want, and makes good economical use of an alkaline type. At 6mA, modern PP3 rechargables will last 20 hours or so, and alkalines will last a couple of days. There's nothing to stop you changing the frequency to work on LW but you'll need to scale the oscillator capacitor, the PWM capacitor and the output filter capacitor by the same factor. Output loops will need more turns too. Harmonic generation will be relatively higher when using longwave as the 4069 has more gain there so will present relatively sharper edges. Because of this it would be best to choose a frequency and make a resonant output loop for it, either air or ferrite rod based. It's interesting to think about how you might make an efficient high power AM transmitter by taking the PWM signal all the way through the PA driver stages to the output. This would allow all those stages to operate in efficient saturated mode and makes the design easy. There'd be no clever temperature compensated biassing required in the output stage, just a suitable energy storage inductor or tank to turn the PWM into AM, which you normally have anyway in some form. I've no doubt that there are commercial designs around where something like that has already been done. I think you might need to fancy-up the circuit a bit though, to make sure that there isn't a lot of phase modulation. Should you need an unbuffered CD4069UBE, a small flat ferrite and some other parts, by coincidence I just happen to have some in the Useful Components Ebay Shop.